We are at a moment of unprecedented peril. But our collective campaigning has created a small window of opportunity. Our future really is in the balance. That’s where people like you come in. People who get it. People who are ready to act. Will you help tip the balance towards hope? Our politicians are paying attention to climate change like never before. But they still just don’t really get it, as evidenced by the recent Budget , which came the day after the UN climate science report and still ignored climate change. At a spontaneously organized protest outside the Dáil, where hundreds gathered just days later, a student activist caught the mood well when she told the crowd “We are scared. We are angry. We are here to make them act" . Now we want to talk to every TD in the Dáil to drive home the need for #ClimateActionNow. Will you join us? On Wednesday 5th December, we’re taking over Buswells Hotel opposite the Dáil to organize conversations between constituents and their TDs. One the same day, the new Minister, Richard Bruton, who is talking about “a revolution” to tackle climate change , will be presenting to the special all-party Committee on Climate Action. The EPA will also be publishing the latest figures on Ireland’s climate polluting emissions, which are certain to be alarming. And we want to tell every TD that it’s time for #ClimateActionNow. We’ve organized lobby days like this in the past. They have been crucial to winning key amendments to the climate law, like making sure the advisory council Prof John Fitzgerald chair was truly independent. And like building support for the Divestment Bill that is now on the verge of becoming law. Come along on December 5th. You don’t have to be an expert in climate policy, you just have to be expert in being a human worried about climate change. It doesn’t matter if you have never spoken to your TD before. In fact it makes it all the more powerful. There’ll be staff and volunteers from various members of the Stop Climate Choas Coalition there all day to support you no matter what time you come between 10am and 7pm. We’ll let you know which of your TDs have confirmed and what time they plan to be there. On Christmas Eve 1968, three Nasa astronauts on Apollo 8 became the first people to leave Earth’s orbit. They travelled around the dark side of the moon and then, suddenly, they saw the Earth rise over the horizon, just as we see the moon rise here. 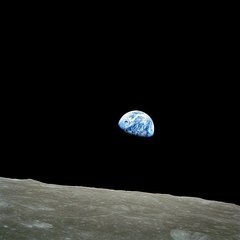 Awestruck, William Anders captured the first full-colour picture of Earth from space and created one of the most iconic photographs of the 20th century: Earthrise . In the 50 years since that photo was taken humanity has raised the global temperature by ½ a degree Celsius and wiped out 60% of the world’s animal populations. The stable climate that has made human civilization possible is on the brink of breakdown. Earth is our only home. It’s time to rise before it’s too late. Register now for #RiseforClimate, Jobs and Justice on December 5th. Give what you can now to help us organize this and more climate campaigning. Together we can tip the balance. for the Friends of the Earth team. P.S. Energy and momentum for #ClimateActionNow is building in Ireland. A recent protest organised almost entirely online over the course of a week managed to attract hundreds of attendees and make national headlines. And today, Saturday November 17th at 2pm, hundreds are expected in Dublin, Galway and Cork as national Extinction Rebellion demonstrations take place to highlight the urgency of the crisis and the scale of action needed to avert climate catastrophe. The public is ready to #RiseForClimate. Please forward this email to anyone you know who may want to come on the 5th. "A major new climate report slams the door on wishful thinking." "Summary for Policymakers of IPCC Special Report on Global Warming of 1.5ºC approved by governments." "U-turn on carbon tax 'two fingers to younger generations"
 "Climate change protest: ‘We are scared. We are angry’: Over 300 people gather at Leinster House to urge State action to prevent global warming"
 "Threat of climate change requires ‘revolution in how we live’, says Bruton"